President Obama paused while making a statement Wednesday at the White House about the IRS scandal. The White House blames a trio of scandals on all the president’s underlings. 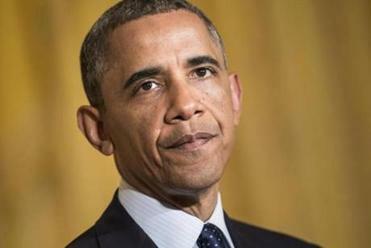 President Barack Obama wasn’t involved in the IRS decision to target conservative groups. He didn’t know about the Justice Department’s decision to subpoena the telephone records of the Associated Press. The CIA and State Department — not anyone at 1600 Pennsylvania Ave. — battled over talking points to describe what happened during the deadly Benghazi attack. If that holds true, Obama is no Richard Nixon. The 37th president of the United States micromanaged a dark agenda direct from the Oval Office. But Obama’s distance from controversies undermining his own administration is not necessarily a badge of honor. What if they happened because the chief executive responsible for setting policy and a moral tone often went AWOL? Five months into his second term, Obama’s distaste for the nitty-gritty of governing is well-documented. Lobbying Congress is a chore and a bore. “Why don’t you get a drink with Mitch McConnell?” he joked at the White House Correspondents Dinner. It was funny, but now the joke’s on him. Obama’s cool superiority provides the backdrop for a series of events that play right into the hands of the Senate minority leader and the rest of the president’s political enemies. If the buck doesn’t start with him, as Obama sees it, it doesn’t stop with him. But that’s not the way the blame game works in partisan-driven Washington. What the Benghazi-IRS-AP scandals suggest — and what victims of drone strikes and people such as Aaron Swartz might testify — is that protections like the Bill of Rights are inadequate. In speeches, such as the commencement address he delivered on May 5 at Ohio State University, Obama is eloquent about taking ownership of wrongdoing. When there’s a betrayal of trust on his watch Obama tells the country he feels angry and disappointed, just like the rest of us. He takes responsibility for fixing those wrongs — but not necessarily for allowing them to happen. It’s as if he thinks of himself as the average, outraged citizen, not as the president with the power to set high standards of behavior for everyone who works for him. Based on that analysis, the acting IRS commissioner takes the fall for a district office’s improper targeting of conservative groups. Interagency jockeying is to blame for controversial edits regarding the Benghazi attacks. He lets Attorney General Eric Holder blame his own underling for making the call to monitor AP phone calls. In Richard Nixon’s administration, the underlings were following their leader’s orders. In Obama’s, the underlings may be filling a leadership vacuum. Once they get Obama into trouble, his first instinct is to hang on, not let go. Last Tuesday, the Treasury Department’s inspector general found the agency had used “inappropriate criteria” to evaluate the political groups applying for charitable, tax-exempt status. If the president was as outraged as he said he was, why did it take until Wednesday to seek the resignation of IRS acting commissioner Steven Miller? Obama has “complete confidence” in Holder. Instead of holding the AG accountable for the AP subpoena controversy, Obama’s response is to revive legislation that would provide greater protections to reporters who utilize confidential sources. On Benghazi, the administration released 100 pages of internal e-mails. But the move seemed less about transparency and more about a desire to show the White House wasn’t involved in editing the talking points to downplay the possibility of a terrorist act. Never mind that the battling agencies report to the guy in the Oval Office. Obama’s eye is on a bigger prize, his broad legacy as president. But if he cares about preserving that legacy, he should heed his own rhetoric. Whenever Obama abdicates too much authority, the pettiness he despises has a greater chance of undercutting the greatness he wants to achieve.